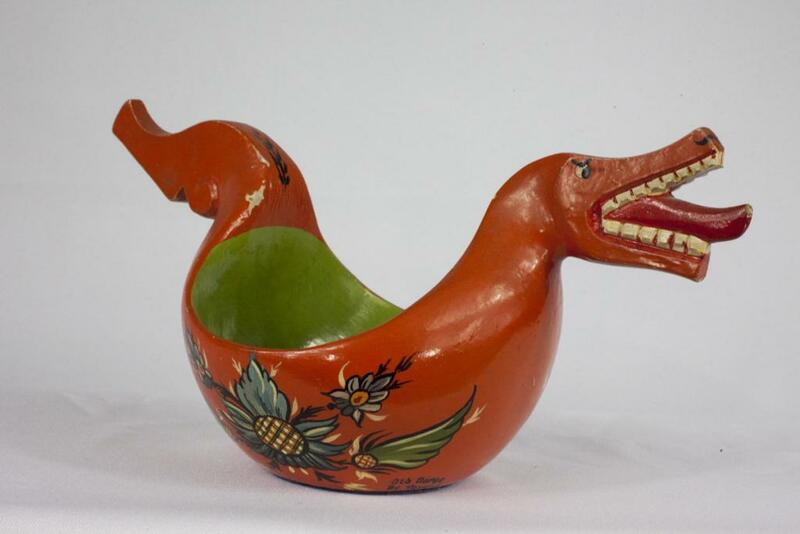 This dragon-headed ale bowl is an example Norwegian crafts created as souveniers by one of the first people in Mount Horeb to market Norwegian identity. Trygve Thoreson Sr. witnessed a revival of traditional crafts as a child in early 20th century Norway and was part of their renaissance among Norwegian Americans. In this piece, Thoreson brings together the more recent traditions of carved ale bowls and rosemaling with the evocation of the Viking past. Norwegian bowls with handles carved in the shape of animal heads originated in the late sixteenth and early seventeenth centuries. These bowls, called kjenge in Norwegian, were used for serving ale during social events. At important events such as weddings and funerals, ale was served out of large bowls in which smaller bowls would float and bob in the intoxicating drink. Made in a variety of different forms, the bowls often varied depending on local traditions. The most common variety had two handles, both carved in the form of horse heads. In addition to the carved handles, these bowls are often decorated with chip carving and rosemaled patterns. The dragon-headed form traces to the eighteenth century, however it experienced increased popularity with the rise of the souvenier industry in Norway at the end of the nineteenth century. This time period saw a surge in interest in Vikings and old Norse and Germanic cultures. The Vikings, long shunned, were now incorporated into the national heritages of Denmark, Sweden, and particularly Norway. Souvenier vendors and bowl-makers played up the similarity between the dragon bowls and Viking longships. With their already boat-shaped body, these bowls evoke the image of longships with dragon prows. In reaction, some craftsmen transformed their bowls into serving dishes, making the bowls look even more like Viking ships, including shields along the rim and sometimes even adding masts and sails. Thoreson also exploited the Viking connection when he named this particular bowl Old Norse. Trygve Thoreson Sr, born in Norway in 1912, played a role in renewing interest in Norwegian art and heritage in the United States. As a child in Norway, Thoreson observed the revival of interest in rosemaling and other Norwegian traditions. When he was eleven, his family emigrated to the United States. As a young man, after getting married, Thoreson settled in Mount Horeb in the 1930s. To earn money during the Depression, Thoreson started offering food and lodging to motorists. As a way of marketing his hospitality venture, he decorated his Main Street home with rosemaling, turning it into the “Norway House”. Thoreson continued to serve food to the public until 1958. Even after closing the business, he continued to call the house by its name. In many ways Thoreson’s “Norway House” served as a precursor to the way Mount Horeb would decide to brand itself as “The Troll Capital of the World” in the 1970s and 1980s. Thoreson, both in his hospitality business and in the objects he created, like the Old Norse bowl, introduced a new way of using Norwegian identity to Mount Horeb. Perhaps influenced by the Norwegian souvenier trade, Thoreson recognized the potential in commercializing cultural identitiy. While the “Norway House” is gone, its legacy continues in the many Norwegian-themed businesses around Mount Horeb and the surrounding Blue Mounds area. Mount Horeb Area Historical Society. Mount Horeb: Presettlement to 1986: A History Celebrating Mount Horeb’s Quasquicentennial. Mount Horeb, WI: Mount Horeb Historical Society, 1986. Weborg, Johanna. In Viking Land, Or, A Summer Tour in Norway. Evanston, IL: Evanston Press Co., 1901. https://books.google.co.in/books/about/In_Viking_Land_Or_A_Summer_Tour_in_Norwa.html?id=TvZiAAAAMAAJ (accessed May 30, 2017). Victoria & Albert Museum. “Ale Bowl.” http://collections.vam.ac.uk/item/O49624/ale-bowl-unknown/ (accessed May 30, 2017).